Differentiated control of deranged nitric oxide metabolism: a therapeutic option in sepsis? Derangement of nitric oxide (NO) metabolism represents one of the key mechanisms contributing to macro- and microcirculatory failure in sepsis. Sepsis-related therapy combining fluid resuscitation with administration of vasopressor and inotropic agents, however, does not guarantee correction of maldistributed nutritive perfusion between and within organs. Therefore, the differentiated and selective pharmacologic modulation of NO-mediated vascular function could play a useful role in hemodynamic management of patients with sepsis. This viewpoint carefully evaluates the potential role of intentionally using partially opposing effects of NO donors and NO synthase inhibitors to complement current therapy of hemodynamic stabilization in patients with sepsis. Nitric oxide (NO), a small endogenously produced molecule with a very short half-life, has been extensively characterized under physiologic and pathophysiologic conditions and also may represent a therapeutic target. NO synthesis via oxidation of L-arginine is catalyzed by different NO synthases (NOSs). Within the three isoforms, the constitutively expressed neuronal NOS (nNOS) and endothelial NOS (eNOS) are regulated by calcium/calmodulin and post-translational modifications whereas the expression of inducible NOS (iNOS) is stimulated by pro-inflammatory cytokines such as interferon-gamma or tumor necrosis factor-alpha. Released by endothelial cells, NO increases blood flow by relaxing vascular smooth muscle cells, modulating platelet aggregation and leukocyte-endothelial interactions , and reducing synthesis of pro-inflammatory cytokines . In addition, NO-derived radicals play an important role in the host immune defense against infections by killing phagocytosed microorganisms . Apart from its enzymatic synthesis, NO can be released from S-nitrosohemoglobin with an increased efficiency under conditions of low oxygen tension, explaining hypoxic vasodilation aimed at increasing regional blood flow . In addition, the main reservoir for NO in human plasma is S-nitroso-serum albumin, which allows NO-mediated regulation of vascular tone . NO levels exceeding physiologic concentrations may contribute to extensively disturbed vasoregulation . Experimental studies investigating the influence of systemic inflammation revealed that iNOS is induced with a delay of some hours with a subsequent prolonged production of large amounts of NO [6, 7]. The upregulation and induced expression of iNOS was paralleled with eNOS downregulation in the heart, lung, and aorta of rats during endotoxemia . This pattern suggests that inhibition of eNOS-derived NO synthesis is counterbalanced by iNOS-driven excessive NO production. The combination of NO with superoxide can form the highly reactive oxygen species (ROS) peroxynitrite , which accounts, at least in part, for endotoxemia-induced hemodynamic collapse  and also induces protein dysfunction, lipid peroxidation, and DNA damage . NO competes with oxygen binding at the cytochrome c oxidase, the terminal acceptor in the mitochondrial electron transport chain. This NO-mediated disturbance of mitochondrial respiration is aggravated under hypoxic conditions  and has been reported to correlate with severity of disease under clinical conditions . Mitochondrial dysfunction and cellular energetic failure, in turn, play a crucial role in the development of multiple organ failure during severe sepsis . An increased level of the endogenous NOS inhibitor asymmetric dimethylarginine (ADMA) was associated with reduced endothelial NO production and micro-vascular dysfunction and correlated with the severity of organ failure in patients with sepsis . In a human sepsis model, NO-mediated vasodilation in the cutaneous micro-circulation was inhibited during acute endotoxemia . Hand-held microscopes introduced the possibility of visualizing the microcirculatory blood flow of patients at the bedside. In patients with severe sepsis, sublingual microcirculation measured by the orthogonal polarization spectral imaging technique showed a significantly reduced amount of perfused small vessels compared with humans without sepsis and a reduced proportion of perfused small vessels in non-survivors compared with survivors, suggesting a functional interrelationship between impaired sublingual microcirculation and negative outcome in patients with sepsis . In patients with septic shock, side stream dark field imaging demonstrated a decreased perfused capillary density in non-survivors compared with survivors . The development and correct use of measures for improving microcirculatory blood flow may be a promising strategy to further reduce sepsis-associated mortality (Figure 1). In this context, it is indispensable to determine causation or association of microcirculatory changes and the patient's condition. Given the anatomical and practical limitations preventing accessibility of the target microcirculation in the organ of interest, clinicians usually have to rely on easy-to-access areas, such as the sublingual region. The nature of sepsis-related systemic changes, in turn, favors the use of the sublingual region to indirectly assess effects of pharmacologic modulation. This, however, must be combined with safety parameters to prevent missing pharmacologically induced vasoconstriction when modulating functionally heterogeneous regulatory pathways. Potential management of severe sepsis. The improvement of perfusion and thereby oxygenation on the microcirculatory level possibly resulting in improved organ function could be an additional aim to the classic treatment regimen in severe sepsis and septic shock. Sepsis-related alterations in NO metabolism have prompted pharmacologic studies aimed at reducing as well as increasing NO. Different iNOS inhibitors have shown positive effects in animal models (for example, on pulmonary function (BBS-2) in ovine sepsis  and in porcine sepsis ) (Table 1). In this context, it has been reported that iNOS inhibition by L-N6-[1-iminoethyl]-lysine (L-NIL) alone , especially when combined with a superoxide neutralizing compound (that is, 4-hydroxy-2,2,6,6-tetramethyl piperidine-N-oxyl, or Tempol), ameliorates gut mucosal microcirculatory derangements  (Table 1). Pulmonary gas exchange improved and airway obstruction was partially reduced. Low and moderate doses increased mesenteric blood flow. iNOS, inducible nitric oxide synthase; L-NIL, L-N6-[1-iminoethyl]-lysine; LPS, lipopolysaccharide; MAP, mean arterial pressure; NO, nitric oxide; NOS, nitric oxide synthase; SIN-1, 3-morpholino-sydnonimine; Tempol, 4-hydroxy-2,2,6,6-tetramethylpiperidine-N-oxyl. In a placebo-controlled multi-center phase III clinical study, the effects of 546C88, a non-selective NOS inhibitor, were studied in patients with septic shock. However, increased mortality in the verum group resulted in a premature termination of the study  (Table 1). Likewise, the Phoenix trial, investigating the effects of the NO scavenger pyridoxalated hemoglobin polyoxy ethylene in patients with catecholamine-resistant distributive shock, has been stopped prematurely because of the absence of beneficial effects . NOS inhibition has provided heterogeneous results. It is important to consider, among other reasons, the type of NOS inhibitors - that is, selective versus non-selective, the species treated (that is, rodent versus large animal versus humans (volunteers versus patients)), and the time point of administration (that is, early versus late phase). While non-specific NOS inhibition might exert negative effects, the development of highly selective iNOS inhibitors appears promising. Lange and colleagues  reported that pulmonary eNOS protein expression at 8 and 12 hours and iNOS protein expression from 8 to24 hours after injury in septic sheep were significantly increased with unchanged nNOS protein expression at any investigated time point. More studies are required to further characterize the mechanisms and influence of different NOS isoforms and NO concentrations during the course of the disease in the face of concomitant therapeutic influences. One experimental strategy aimed at attenuating deranged microcirculation during sepsis is to increase NO availability via administration of NO donors. In this context, attenuation of LPS-induced increase in platelet adhesion to endothelial cells of murine intestinal venules by the NO donor diethylenetriamine-nitric oxide (DETA-NO)  indicates an NO-mediated protective influence on microvascular blood flow. Endotoxemia-induced inhibition of eNOS-derived NO  can be positively influenced by infusing, for example, the NO donor sodium nitroprusside. In fact, this approach significantly improvedLPS-induced impaired hepatic microcirculation at 2 and 3 hours after endotoxemia-induction in rats , and the NO donor 3-morpholinosydnonimine (SIN-1) increasedcardiac index and mesenteric blood flow and improved myocardial function in the early phase of endotoxic shock in fluid-resuscitated dogs . These data strongly suggest that the window of opportunity to replace insufficiently released eNOS-derived NO by an NOdonor is during the early endotoxemic phase (Table 1). Following pressure-guided fluid resuscitation in patients with septic shock, intravenous infusion of the NO donor nitroglycerin at a loading dose of 0.5 mg and a subsequent continuous infusion of 2 mg/hour improved the disturbed sublingual microcirculation within 2 minutes after administration of the initial nitroglycerin dose. This finding strongly supports the notion that impaired microvascular flow can be improved by cautiously infusing nitroglycerin following previous restoration of intravascular volume  (Table 1). In a double-blind randomized placebo-controlled trial in which nitroglycerin was administered at 2 mg during the first 30 minutes and 2 mg/hour during the subsequent 23.5 hours following systemic resuscitation of patients with severe sepsis, no additional nitroglycerin-mediated improvement in the microvascular flow index was observed after 24 hours. However, mortality in the nitroglycerin group exceeded mortality in the placebo group: 34.3% versus 14.2% (n = 35 per group)  (Table 1). In this context, it is important to consider that the use of nitroglycerin to manipulate NO levels relies on the availability of specific enzymes. As such, aldehyde dehydrogenase type 2 (ALDH2) is essential to generate NO . Under septic conditions, however, this enzyme might be depleted . A target-oriented increase in NO availability, at least within the first few hours after onset of severe sepsis, appears to allow successful modulation of microvascular dysfunction. Further studies need to determine under which circumstances titration of an NO donor may be efficient and safe to correct a deranged microcirculatory blood flow. Given that certain pathophysiologic processes are limited to the early phase, in which patients are rarely accessible to pharmacologic modulation, timing will play a crucial role. In daily routine, patients are seen mainly during their later phases of severe sepsis with prevailing extensive vascular hyporeactivity. Nevertheless, patients developing sepsis during their hospital stay could be amenable to early approaches as studied under experimental conditions. In this context, studies in clinically relevant animal models considering not only the very early stage of (severe) sepsis but also later stages might be useful. Before introducing a complex concept of simultaneously or sequentially activating and attenuating NO pathways, it is also important to characterize the potential conflicting influence of standard measures of treating sepsis on the targeted NO pathways. The following paragraphs provide a brief overview of the interrelation between conventional therapeutic strategies in the treatment of severe sepsis/septic shock and NO metabolism. Under in vitro conditions, the antibiotic polymyxin B reduced LPS-induced NO production in rat hepatic Kupffer cells reflected by decreased NO2− levels . Ceftazidime significantly decreased the concentrations of pulmonary 3-nitrotyrosine (a biomarker of nitrotyrosine formation) in sheep with acute lung injury and sepsis , indicating reduced nitrosative stress. Whether this effect is antibiotic-specific, occurs dose-dependently, and can be excessively increased by the co-administration of several antibiotics and whether the same mechanisms persist under conditions of antibiotic resistance remain to be determined. In an endotoxemic rat model, fluid resuscitation with albumin reduced LPS-induced increase of cardiac iNOS mRNA and protein expression . Under in vitro conditions, increased flow seemed to cause endothelial shear stress, resulting in the release of NO and vasorelaxation . However, fluid resuscitation may influence NO synthesis, and this should be taken into account when establishing a new therapeutic concept aimed at controlling deranged NO levels. In isolated rat hepatocytes exposed to pro-inflammatory cytokines, epinephrine and norepinephrine reduced NO production reflected by significantly decreased NO2− . In incubated macrophages (RAW264.7 cells), however, epinephrine or norepinephrine enhanced LPS-induced increase in NO production . In endotoxic rabbits, dobutamine administration was associated with reduced NO synthesis reflected by decreased NO3−/NO2− concentrations in serum and the gut luminal perfusate . More studies are required to characterize organ-specific and dose- and duration-dependent effects of vasopressors and inotropics and the influence of their continuous, prolonged, or short infusion on NO synthesis, metabolism, and downstream pathways. In a sheep model of septic shock, iNOS inhibition with BYK191023 was superior to norepinephrine in improving microcirculation; interestingly, combined administration of both substances versus single dosing markedly increased the maintenance of arterial pressure and kidney blood flow . The available data suggest a dose-dependent effect of hydrocortisone on NO synthesis. Whereas a loading dose of 100 mg over 30 minutes followed by a continuous infusion of 10 mg/hour for 3 days significantly decreased plasma NO3−/NO2− levels , administration of hydrocortisone 50 mg/6 hours did not affect plasma NO3−/NO2− levels in patients with septic shock . Overall, the impacts of these standard measures in the treatment of severe sepsis/septic shock on NO metabolism have not been definitely clarified. Further studies are needed to uncover the influence of standard therapy on the release of NO, degradation, and downstream pathways. The development of a therapy to adequately regulate NO synthesis by controlled increase as well as decrease, including organ-specific changes, might be a promising step forward in the treatment of severe sepsis/septic shock. The concept of a well-controlled combination of fluid infusion together with the administration of an NO donor and an iNOS inhibitor might improve locally deranged microcirculation under conditions of regionally and temporally heterogeneous NOS expression. In addition to NO-related issues, the impact of quantity and quality of fluid therapy on NO production and degradation as well as phase-specific requirements must be characterized. Perhaps pharmacologic modulation may close the gap when fluid administration is not necessarily appropriate to correct microcirculatory disturbance in patients (for example, during the late phase of severe sepsis) . New therapeutic strategies targeting both macro- and microcirculatory dysfunction should be investigated to assess whether such approaches are effective to prevent or treat organ dysfunction and failure. Fluids are directed predominantly to the iNOS expressing mucosa during fluid resuscitation, thereby shunting the serosa microcirculation . Combining fluid resuscitation with either the iNOS inhibitor 1400 W  or the NO donor SIN-1 normalized serosa micro-vascular oxygenation . This strongly suggests that iNOS inhibition may help to redirect blood flow to the serosa, thereby promoting correction of sepsis-associated heterogeneous blood flow while the NO donor promotes and supports intended blood flow redistribution through its vasodilatory effect . In logical consequence, combining fluid resuscitation with iNOS inhibition, plus NO synthesis to regulate NO-mediated pathways spiraled out of control during sepsis, encourages further studies (Figure 2). Hypothetical mode of action to improve microcirculation during severe sepsis. An approach to improve microcirculatory blood flow during severe sepsis and septic shock could consist of a nitric oxide (NO) donor to substitute inevitable endothelial nitric oxide synthase-derived physiologic concentrations of NO and a selective inducible nitric oxide synthase (iNOS) inhibitor to prevent excessive and heterogeneous NO production. On the other hand, it needs to be considered that reduced NO synthesis might promote disease progression as NO is decisive in the killing of microorganisms . This is also reflected by significantly delayed bacterial clearance and higher mortality  following non-selective NOS inhibition by Nω-nitro L-arginine methylester (L-NAME) administration in septic rabbits. In regard to host defense, NO level manipulation in septic animals revealed controversial results which may be due to differences in, among other things, the timing of NOS inhibition . In addition, NO-driven sustained peroxynitrite synthesis impairing vasoreactivity must be considered. Given that results from animal studies might not necessarily be completely transferable to humans, several issues have to be clarified before establishing the concept of improving the microcirculation by combining volume therapy with specific iNOS inhibition and an NO donor. In addition, the question of whether a disturbed micro-circulation is just epiphenomenal or indeed the cause for higher mortality in sepsis has to be addressed. The outlined therapeutic concept must consider the temporally and regionally (organ-specific) heterogeneous changes in NOS expression/function, NO levels, and NO-mediated effects. Thus, co-targeting a reduction as well as an increase in NO levels might also involve a selected intra-arterial approach to reduce undesired systemic effects. The time window for administration and the dose of each compound are key aspects that need to be defined. 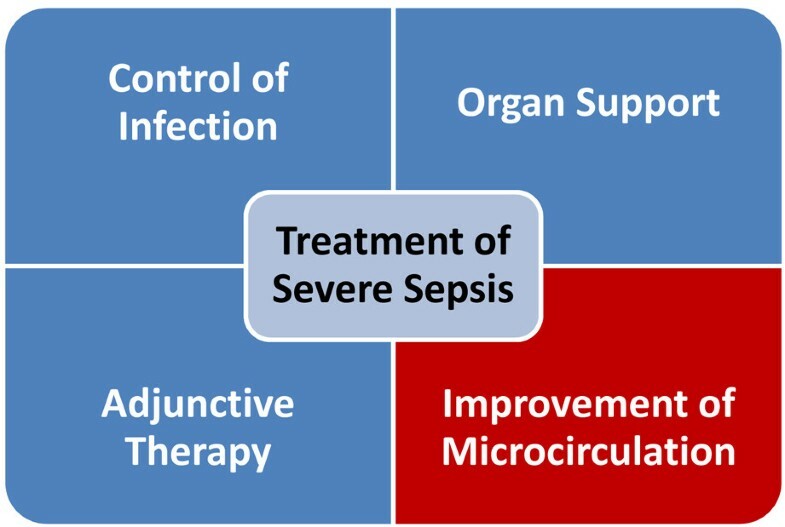 The approach described above also must consider that the current standard therapy for patients with sepsis consists of interventions that by themselves already influence NO-mediated pathways. Given the heterogeneity of the patient population, the plethora of different important influences determined by components of routine interventions (antibiotics, crystalloids, colloids, transfusions, steroids, vasopressors, and inotropics), patient-specific features (age, gender, ethnicity, and comorbidities), time-point of treatment, phase-specific requirements, severity of illness, and other factors will probably require a well-differentiated and personalized treatment concept. Since the effects of (simultaneous) NO donors and inhibitors are not easy to anticipate, these agents should be carefully titrated and used only on the basis of an adequate intravascular volume status to prevent them from contributing to hemodynamic collapse as well as excessive ischemia-promoting vasoconstriction. Appropriate monitoring for a safe and efficient treatment is mandatory and should include bedside visualization of the microcirculation together with further global and regional surrogate markers of altered perfusion, such as lactate, SvO2 (venous oxygen saturation), cardiac output, organ function, and organ-specific biomarkers. Future clinical studies need to determine whether such differentiated manipulation of the NO pathways reduces overall morbidity and increases the likelihood of survival. CI is beneficiary of educational grants and speaker fees from AM-Pharma (Bunnik, The Netherlands), Baxter (Deerfield, IL, USA), B. Braun (Melsungen, Germany), Fresenius Kabi (Bad Homburg, Germany), Hutchinson (Hutchinson, CA), and Novartis (Basel, Switzerland). SB, CL, FN, JFS, and MW are employees of Fresenius Kabi. CL drafted the manuscript. SB, CI, FN, JFS, and MW revised the manuscript for important intellectual content. All authors read and approved the final manuscript.